Singapore's defence minister Ng Eng Hen addressing the 15th Shangri-La Dialogue. 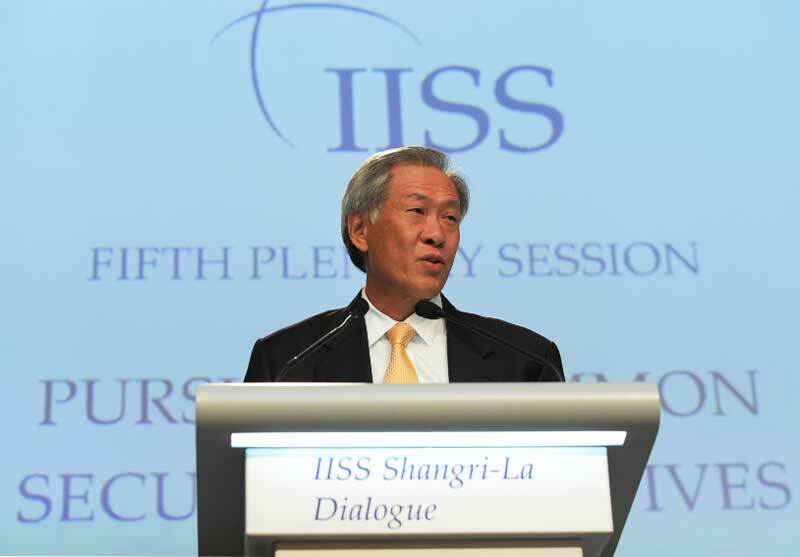 By Abhinav Tripathi | New Delhi/Singapore: In a worrying confirmation, Singapore's defence minister Ng Eng Hen says the Islamic State is recruiting more manpower in ASEAN region than rival Al-Qaeda. "In the past three years alone, IS has recruited more sympathisers and operatives in ASEAN than Al-Qaeda did in the last decade, with more than a thousand fighters in Iraq and Syria," he said at the concluding session of the 15th Shangri-La Dialogue in Singapore. The dreaded terror group has reportedly capitalised on existing smuggling routes to move recruits and arms in the region that include Southern Philippines, Indonesia, Malaysia and Singapore. "Some (recruits) transit through Singapore in the hope of eluding authorities by taking multiple hops to their final destinations," the minister added. In a bid to curtail movement of extremists, Malaysia, Indonesia and the Philippines are mulling over joint patrols in Sulu-Sulawesi Seas, labelled as the ‘terrorist transit triangle'. The Shangri-La security summit offers an annual dialogue platform for Asia-Pacific defence ministers, military chiefs and intelligence officials. This year, the three-day long event convened more than 500 delegates from 35 countries. Around two weeks ago, the Islamic State released its “first” propaganda video explicitly targeting Southeast Asia. The sixteen-minute clip showed children clad in military outfit burning passports and denouncing their Asian citizenships. Produced by the Malay-speaking unit of IS - Katibah Nusantara, the propaganda material also featured group's leader Zainuri Kamaruddin saying the “cubs of the caliphate” were preparing themselves to “become the fighters of tomorrow”. Adding more substance to random threats, terror training camps have been reported in Poso in Central Sulawesi and Southern Philippines. "This gathering storm has the real potential to destabilise this region, if not tackled decisively and together," Eng Hen warned. About 30 active groups have pledged their allegiance to IS in ASEAN region, including Jamaah Ansharud Daulah, which claimed the responsibility for January’s Jakarta attack.